Grow Brownsville is a project aimed to building the Universe City Food Hub that will house the First Commercial Aquaponic/Hydroponic Farm in the Brownsville/East New York area, bringing the GreenTech Revolution to the Brownsville/East New York Industrial Business Zone. Residents of Brownsville and East New York not only deserve access to Fresh Food, but the opportunity to learn about and grow organic hormone-free food with their own hands. “Our goal is to serve the food systems within the Brownsville and East New York community such as schools, shelters, and local restaurants” stated Alexis Mena, Co-Founder of Universe City. This project is the result of efforts of local artists, entrepreneurs, and residents coming together to think, and act on new ideas on how to liberate their community and themselves from cycles of violence, poverty and displacement. 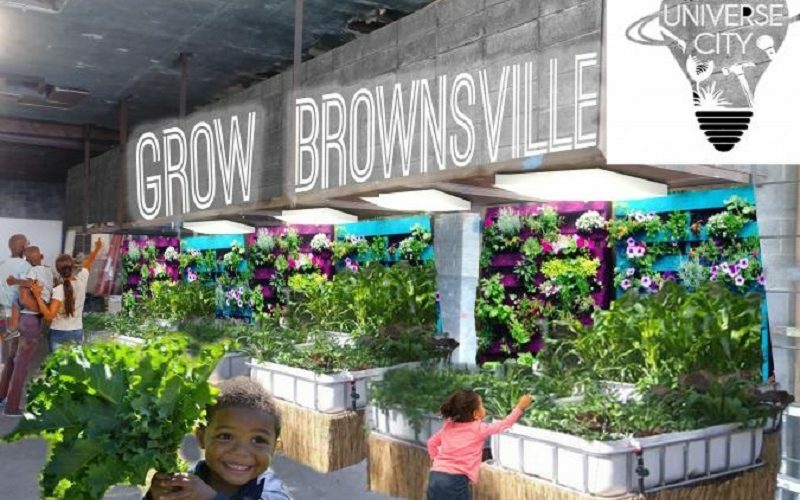 Grow Brownsville is a direct response to the need for shifts in food culture, healthy food access, entrepreneurial training, and the ability to obtain these things for ourselves. Poor health outcomes tend to cluster in places that people of color call home and where many residents live in poverty. Obesity can lead to serious health problems such as diabetes and heart disease. The diabetes rate in Brownsville is 15%, the sixth-highest rate in the city. Our farm will work with public housing residents, schools, and shelters to directly affect local food systems. To Support Grow Brownsville, or Volunteer click here. Next PostFree Online Tax Help At The New Lots Library On February 4th!